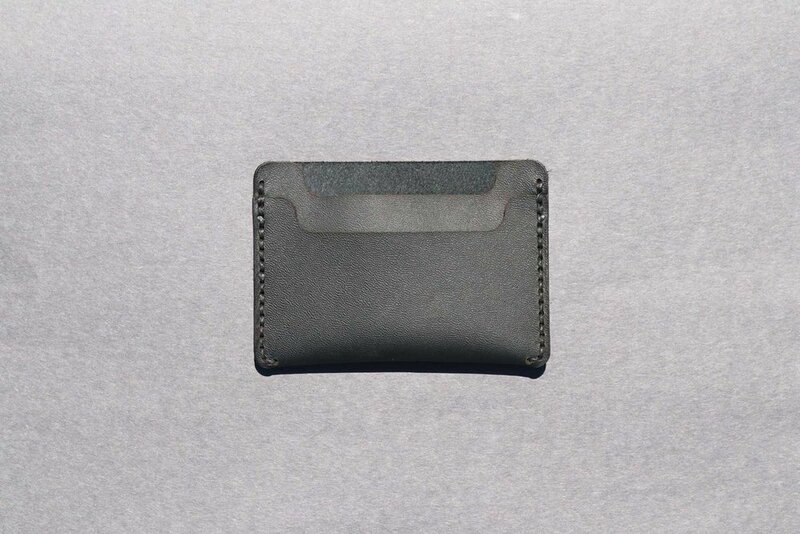 In April of 2018, I set out on a goal to design a minimal leather wallet and make 100 of them by the end of the month. Although this might sound like a tough goal, it was one that I thought would help me get better at the craft of leather working and also have a collection that I could eventually give away as gifts to friends and family and sell to people who were interested in buying one. Here’s how the process went and what I learned from the experience! 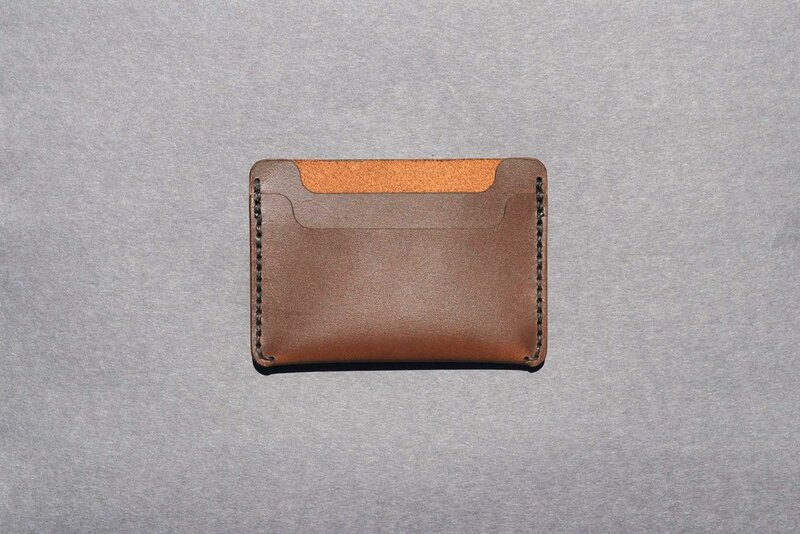 At the start of April, I developed a design for a minimal leather wallet that was simple and slim. The design took about 30 minutes from start to finish and required a lot of physical measuring of credit cards and United States Dollars. The biggest struggle that I’ve had with leather working so far is that I have to think ahead and build in the necessary tolerance for items to fit into the product. As you can probably tell from that sentence, there’s often several prototypes that are created for every product because it requires lots of trials to find the errors that need to be resolved before I consider the product complete. Once the design was complete, it was time to cut it out of 5 different types of leather that I selected for this project. Typically, one would cut this design into a template, which is a thick material that leather workers lay on top of the leather to guide their cuts with a knife. This used to be my process of working until I received a laser cutter that I crowdfunded two years ago. With this new piece of equipment, I was excited to try leather on the machine. After cutting each different type of leather to a size that would fit in the laser cutter and accommodate the pieces in the most efficient way possible, I setup a test run to figure out the best laser settings and started cutting the wallets. Once the cuts were complete, they all required some cleaning and it was off to hand stitch each one. Although it might sound like laser cutting leather reduces the amount of time and physical labor of making a handmade leather product, I’d say it’s just a different method of starting the process. After the leather is laser cut, it takes a lot of time and is very laborious to clean the edges and holes so that the hand stitching comes out nice and clean. When the pieces were ready for hand stitching, I chose to not glue the pieces together which is a personal preference. To hand stitch the leather wallets, I pinched the edges together and slowly aligned them so that they were level and straight. I quickly transitioned the folded wallet to the stitching pony and clamped it down so that I could start the stitching process. Then, I was off to the races where I hand stitched 100 wallets over two and a half weeks. 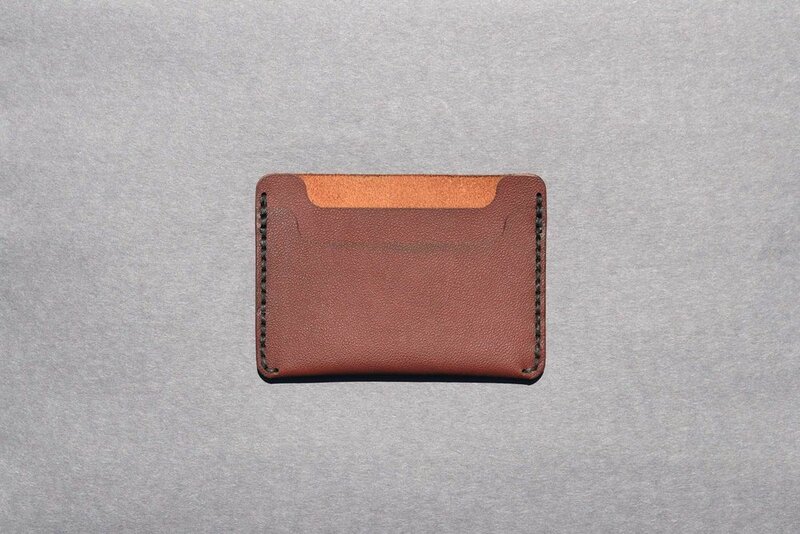 First, I learned that I’m capable of making 100 minimal leather wallets by hand, which I thought was a stretch goal. If I were to try this goal again, it would probably take 75% less time because I have a better process and I’m familiar with all of the labor involved with making each one. Second, I became more efficient at stitching where the first minimal wallet took between 25 to 30 minutes and the last one took 10 to 15 minutes. Third and most importantly, I learned to share my work along the way. Putting my process out on platforms like Instagram through stories and other features allowed me to get feedback and motivation from my family and friends who interacted and commented. Ultimately, I’m happy that I decided to pursue a goal that was outside of the field of architecture because it allowed me to get back to imagining an object, sketching it out, drafting it on my computer, physically cutting it out, and assembling the minimal wallet. Sometimes, we forget that the things we’re imagining can become a reality. It just takes time, effort, and persistence to get the project on the right track and to push through the exciting and grueling moments. For me, the end is just as exciting as the beginning! As some of my projects come to an end, others are just beginning including project 20x30 which is designing and making 100 leather wallets. I know this isn’t an architecture project, but my journey so far has helped me realize my passion for design and leather making. After designing and constructing several leather bags late last year, I decided to take my leather making hobby to a new level. 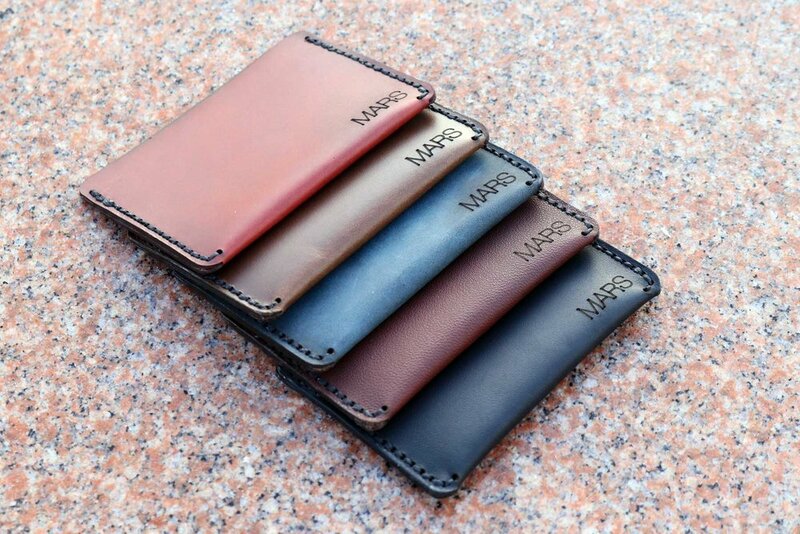 To pursue this newfound passion, I’ve set out to design and make 100 leather wallets by the end of April 2018. Here’s where I am after two weeks of hard work!